First of all, let me just say that I ordered light green linen thread online, and when it arrived I saw that it was really more of a mint dental floss electric green. 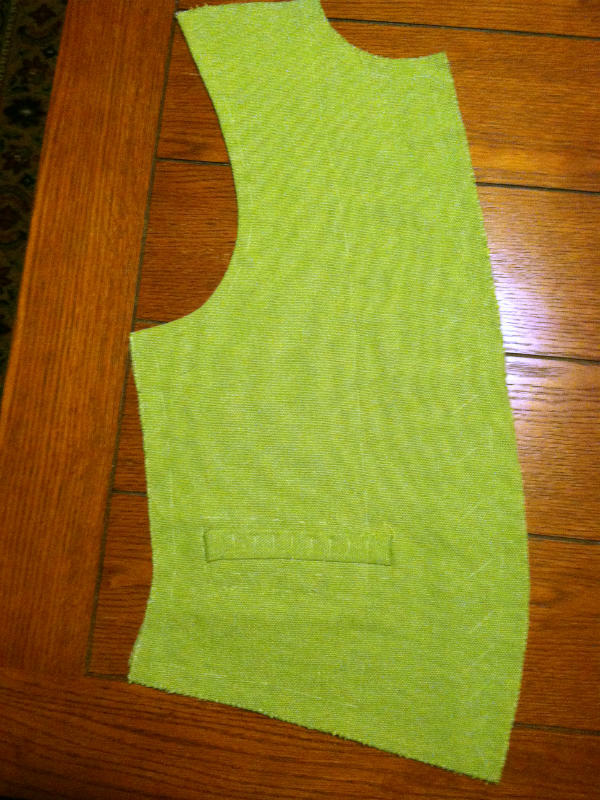 I suppose that since the fabric for this waistcoat is made of green and yellow threads that I should have gone for the lighter yellow instead of green anyway, but I'll stick with this and just use it where it won't show anyway. 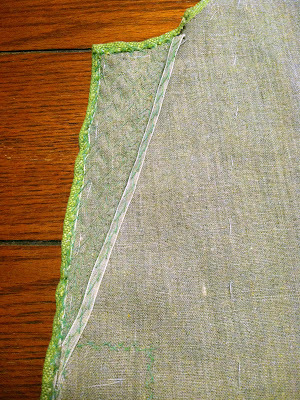 I finished all of the welt pockets and basted them shut so they don't pull out of place while I work with the canvas. 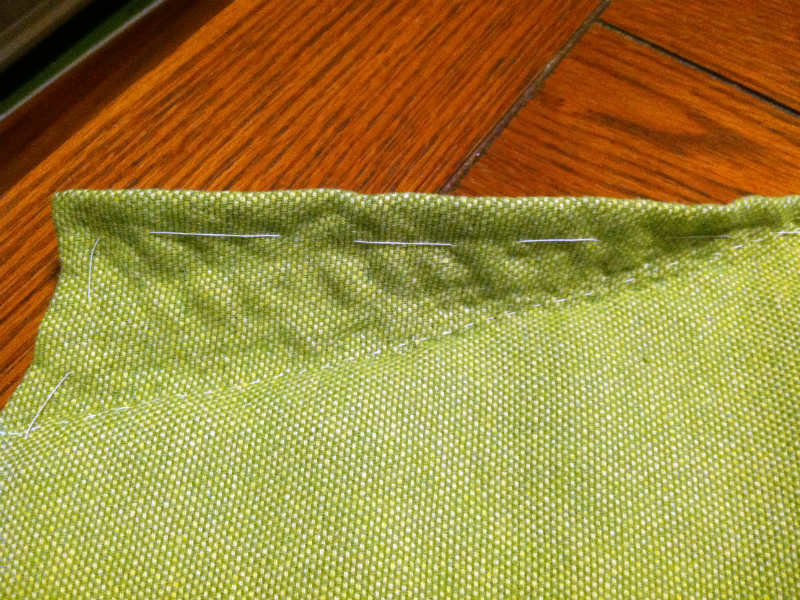 I also basted the pocket bags folded up in half so they don't accidentally get sewn into the canvas or seams. The next step is interesting because it uses the waistcoat itself as the pattern instead of the paper pattern. Because I stretched the fabric in a few places (on purpose, with an iron, to give the fabric some shape beyond its flat nature), I simply lay the fabric on top of the canvas, basted it in place, and then trimmed around the edges. I then trimmed an additional quarter inch around all the edges except for the side and shoulder, where it will be seamed to the back piece. The next step was to start shaping the lapels. I will eventually attach the collar to the tops of the lapels and neck. I'm not sure if the stay tape was needed here, but I put it in anyway, and then pad stitched the lapel. I've done this on a sample piece but never for real, and I must say I'm pretty happy with the result. The fabric is now stiffer because of being attached to the canvas, and it also folds back on its own, without any pressing. Below the lapel you can see an additional piece of canvas added for buttonhole support. This is the back of the lapel. The line of basting stitches to indicate the roll line is still there, as well as the basting for the canvas, but otherwise you can't see any bright green thread from the stitches. Just a lot of little dimples. You can see how the lapel doesn't like being opened up flat, and wants to fold back. Almost finished with this side. I just need to add the lining. Stay tape has been basted in around the bottom and front edges, and then the edge of fabric folded up over it (for a better picture of this, look at the the second photo, with the pad stitching - you can see that the edges have all been stitched back) and sewn in place with cross stitching. The stay tape gives it a nice firm edge. The armscye has been cross stitched in place without stay tape, so it's a little softer, and will go around my body better. I said above that I just need to apply the lining. Unlike most modern patterns, this waistcoat is not made in two pieces with a shell and a lining. 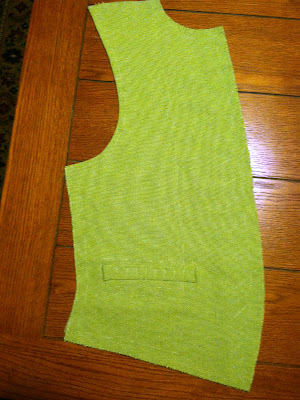 The lining is applied directly to the two front pieces, which are then attached to the back as complete pieces. 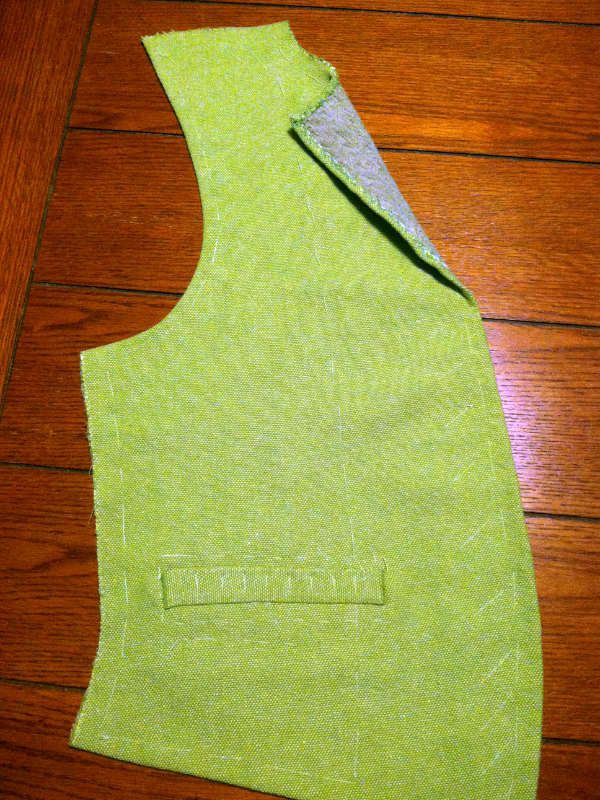 I suppose it would be much easier to alter the waistcoat without having to change the lining, since it's all attached. Does that make sense? It will in my next post. First of all, _very_ nicely done, if my humble opinion counts for anything! As I mentioned in my comment to your trouser-making, I have come to a littlebit different solution on cross-felling the staytape (or the bridle, as is the case here). 1)He states that the cross-felling looks very similar to cross-stitching. As he uses the word similar and not exactly like, I took it there _is_ a difference in forming the stiches. 2)Unfortunately, there is a little more detailed description of cross-felling in the last chapter of the book about coat-making, which meant for me, as I was methodically working through the book one chapter at a time and not reading it all before starting on the exercises, I arrived at this description only after I already had to use the stitch many times. Anyway, J.M. explains it is done like a felling stitch, but alternating between the edges. Which makes perfect sense, as it finishes the edges more cleanly and still looks similar (but not exactly alike) to cross-stiching. I made a drawing, because on the actual photo I made the details couldn't be discerned as clearly. As I am writing this I do not have the book at hand, please forgive me for leaving out the page numbers, I can amend them later if you like. I am not saying I am right, I have no way of really knowing whether I am or not. I really would like to read your thoughts about this. It seems like a small matter, but I really would like to get this right, as it is an important part in shaping and reinforcing all garments from trousers to frock-coats. Marius, do you mind if I use your information and make a post about it, including the pictures? You raise some great points, and I'd like to highlight them. Of course, I do not mind, go ahead! To supply the mentioned page-numbers, the description of cross felling is on page 115 paragraph 2 (trousermaking), and I got a further hint in the coatmaking section on page 139, paragraph taping, stating the tape is to be felled on both edges separately, which would make my cross-felling variant a kind of shortcut for this.